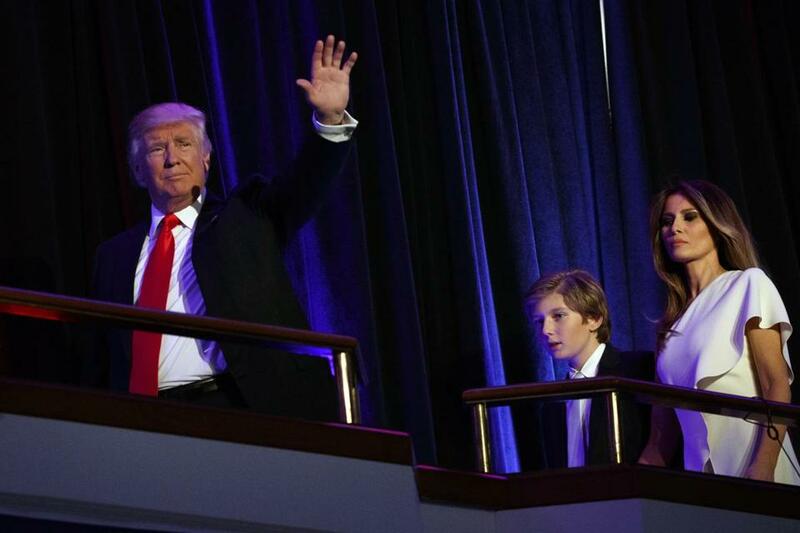 Donald Trump walked with his son Barron and wife Melania to speak at an election night rally. The election of Donald Trump on Tuesday dashed hopes among liberals that the nation’s highest court could have its first liberal majority in nearly a half century, legal and political analysts said Wednesday, and virtually ensures a majority-conservative court for years to come. With a Republican-controlled Senate, Trump is expected to have little pushback in filling the US Supreme Court vacancy created in February by the death of Justice Antonin Scalia. After Scalia’s death, Republicans prevented President Obama from filling the seat with a moderate appointment, Judge Merrick Garland. “The refusal of the Republican leadership to do their job was a high-risk strategy, but it worked,” said Kent Greenfield, a Boston College law professor who predicts Democrats will not be able to stall Trump’s nominee in the Senate. The replacement of Scalia could be just the first of Trump’s influence on the court. Three justices are around the age of 80, meaning more potential opportunities for appointments, especially if Trump serves two terms. Justice Ruth Bader Ginsburg is 83, and Justice Stephen G. Breyer is 78. Both are liberal members of the court. And moderate-conservative Justice Anthony M. Kennedy, who has been the swing vote on divisive issues such as gay marriage and abortion, is 80. None of the sitting justices have suggested they would retire, but if they do, or if they were to die while on the bench, the court could see a shift. “Then, you would have a real opportunity to change the complexion of the court and the direction of the law on the Supreme Court for a long time to come,” said John Malcolm, of the Heritage Foundation, a conservative think tank based in Washington, D.C.
Malcolm wrote an open letter to the presidential candidates earlier this year recommending “constitutionalist” nominees to the Supreme Court, judges who hold the same ideology as Scalia, one that calls for limits on the authority of government. Of Malcolm’s recommendations, six were named on Trump’s list of 20 likely nominees for appointment to the high court. “There are a number of issues that closely divide the Supreme Court,” Malcolm said, naming gun rights, the death penalty, religious liberties, and campaign finance laws. “Replacing Ginsburg with [a constitutionalist] would potentially have a very large impact on the court,” he said. All the potential nominees on Trump’s list except one are sitting judges in state and federal appellate courts. Whoever is appointed to replace Scalia probably would join Justices Clarence Thomas, Samuel A. Alito Jr., and Chief Justice John G. Roberts Jr. as the court’s conservative-minded justices, according to Lee Epstein, a professor at Washington University in St. Louis, who co-authored a study in September analyzing Trump’s potential court nominees. That would mean that Kennedy would remain the pivotal swing vote, and that Ginsburg, Breyer, and Obama’s two choices for the court — Justices Sonia Sotomayor and Elena Kagan — would remain as the liberal-minded justices, according to the study. Epstein said in an interview that the makeup of the court will not see a shift until Trump can appoint at least two people — including Scalia’s replacement — who are more conservative than Kennedy. Jay D. Wexler, a law professor at Boston University, doubted that Roberts would be willing to revisit the court’s decisions on abortion rights or gay marriage, even if the court sees a conservative majority soon. But, he said, the court will have to settle other significant matters in the coming years, on the environment and religious rights, for instance. “There would be a lot more willingness to accept government support of religion in that far right court,” he said. Milton J. Valencia can be reached at milton.valencia@globe.com.